Cabbage rolls to me are the ultimate comfort food. There are surprisingly few ingredients and that’s because you really don’t want to mess with a good thing!! Because there are several steps involved, I always make a double or triple batch and freeze a whole bunch for later… and speaking of freezing- I haven’t had a chance to try this but my friend Karen (cabbage roll goddess!) swears by it. Rather than boiling your head of cabbage and peeling off the leaves, she puts hers in the freezer for a couple hours and then lets it thaw completely. Once the cabbage has been frozen and then thawed the leaves simply peel right off as though you boiled them! Boil (or freeze) you cabbage, separate the leaves, and set aside. In a large pan brown your ground beef, strain off extra fat and put it in a large bowl. In the same pan saute onion and bacon until bacon is fully cooked and add that mixture to the ground beef. Add spices and rice and a couple of tablespoons of the juice from the tomatoes and mix together well. In a large foil lined baking dish spread out about 1/3 of canned tomatoes and juice on the bottom and start rolling! Place a spoonful of meat mixture in the center of a cabbage leaf (whether you like small or large rolls is up to you!) tuck in the sides and roll it up like a burrito. 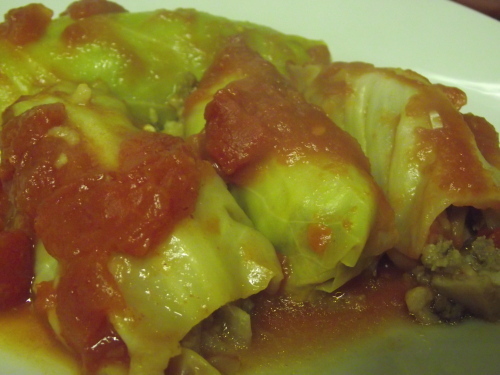 Place each cabbage roll seam side down in the baking dish and pack them in nice and tight against each other. Top the rolls with the remaining tomatoes and juice, cover with foil, and bake at 300 for about 2 hours or until cabbage is buttery soft.